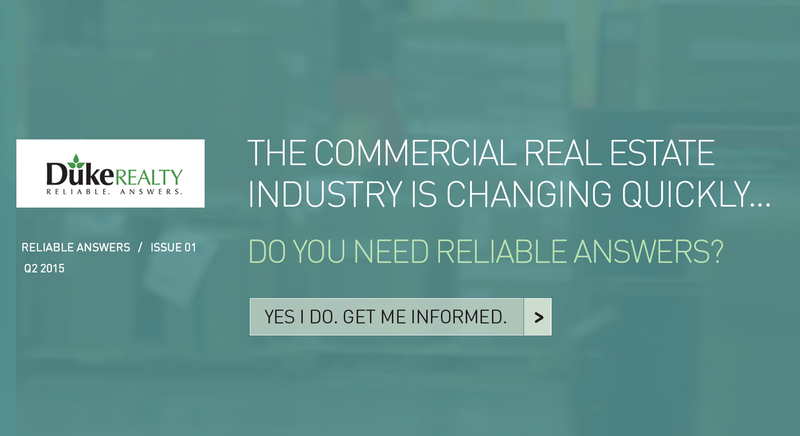 Same-day delivery and its impact are the focus of our very first issue of Reliable Answers, a storybook publication from Duke Realty that delivers solid insight and analysis from industry experts in a dynamic, easy-to-access format. The growth of e-commerce has resulted in big changes in the real estate market over the past few decades, so it’s not surprising that recent advances in same-day delivery have meant big changes to commercial property needs as well. In another video, Kris Bjorson, International Director of Industrial Services in Retail E-commerce Distribution at JLL, speaks to a ten-year strategy evolving behind same-day delivery, including revitalization of class-B and class-C “inside-the-loop” types of buildings with “a good center of population density,” as well as proximity to geographical centroids or ground shipping hubs. A short essay by supply-chain expert James Tompkins, Founder and CEO of Tompkins International, speaks to an evolving standard of service personalization, from “YWGIWISYWGI (You Will Get It When I Say You Will Get It)” to “IWI WWIWI OYTMTP (I Want It, Where and When I Want It, Once You Tell Me The Price).” As Tompkins points out, this simple shift in attitudes has huge implications for customer expectations and the strategies businesses must adopt to meet them. Be sure to get all the details by exploring the storybook below.